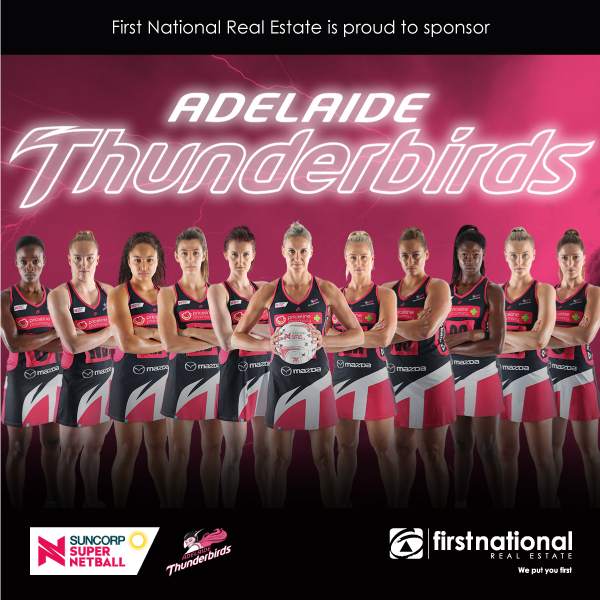 First National Real Estate is proud to announce a corporate partner sponsorship of Netball SA and Suncorp Super Netball team, the Adelaide Thunderbirds. The twelve-month sponsorship will see the Adelaide Thunderbirds underpin First National Real Estate’s commitment to creating opportunities for kids to engage with their sports role models through free tickets and regional clinics in Moonta and Waikerie. A program of South Australia regional visits by Adelaide Thunderbirds ambassadors will also aim to encourage communities to engage in healthy sporting activity through netball. First National’s South Australia Chairman, Mr David Nitschke, said the network is committed to supporting South Australia’s community on a range of fronts. ‘Teaching children about the virtues of good sportsmanship is integral to their understanding of community and the value of teamwork. That’s why we believe so strongly in promoting the unity and competitive spirit that participation in sport brings about,’ said Mr Nitschke. Netball SA CEO Ben Scales said the partnership represents a great union of two organisations that work in the community in a very real way. “First National’s partnership with Netball SA and the Adelaide Thunderbirds demonstrates the company’s commitment to supporting the local communities they operate in,” said Mr Scales. “The partnership and associated investment will assist with the development of netballers at all levels in South Australia. The Adelaide Thunderbirds’ first game of the 2018 season will be played at Priceline Stadium against West Coast Fever on Sunday 29 April at 12:30 pm.